I submitted the index and the last few corrected page proofs for my next book, Funnybooks: The Improbable Glories of the Best American Comic Books, to University of California Press a few days ago, so the book is now well on its way to publication before the end of the year. It's in the nature of such books that additional information will trickle in when it's just barely too late to include it in the book, and that has been true with Funnybooks. Rather than let that fresh information go to waste, though, I've gone ahead and posted a page of corrections, clarifications, and second thoughts, like those I've posted for some of my other books. What I've posted on the new page adds to rather than corrects what will be in the book, but there's no reason to let good stuff go to waste. I haven't yet seen the back cover, but I can tell you that it will have blurbs by Art Spiegelman and Maggie Thompson, two people who know their funnybooks. Maggie told me in an email, after sending her blurb: "My jaw dropped with delighted astonishment at the incredible wealth of information in your book. SO much I'd yearned to know and figured I'd never learn! Wow!" After having read the book multiple times myself in the last few weeks, I can say without blushing that I'm very pleased with it. I hope you'll like it, too. Here's a link to amazon.com's page for Funnybooks. I continue to be disappointed in the price, but that's a problem that should resolve itself if there are enough pre-orders to assuage the publisher's worries about the size of the market for such a book. And now, with a lot of very time-consuming work on Funnybooks out of the way, I can get back to posting here. 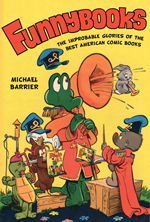 From John K. Richardson: I’m looking forward to Funnybooks! It’s a neat feeling to get a kind of preview by reading your corrections/additions page before even seeing the original. Speaking of that page, it strikes me as refreshing that Lantz (may have) made the Li’l Eight Ball change as a result of personal contact with an individual, instead of a general feeling of wanting to seem more “up with the times” in the eyes of the public—and especially, I guess, that he was thinking of her kids reading these comics. She may have taken him to task in an article, but it has the feeling of an honest correction of an admitted personal shortcoming. MB replies: Actually, I think Verna Arvey (Mrs. William Grant Still) addressed Lantz in a personal letter, not in print, which probably made it easier for him to respond as he did. And speaking of that corrections/additions page I've added a third item, with details about Walt Kelly's first marriage that I didn't get around to tracking down until it was too late to add them to the book without ripping up too much type. ..as I was in my July 23 post, Bob Barrett has come up with another one, a pinup offered to subscribers to Raggedy Ann and Andy at various times over the life of that title as a monthly comic book, between 1946 and 1949.. If, like Bob, you're sharp-eyed when it comes to cartoonists' styles, you'll recognize this pinup as the work not of George Kerr, who drew almost all of the Raggedys' stories throughout that decade, but of Morris Gollub, another Dell/Western Printing stalwart. Like some other Dell pinups I've seen over the years, this one doesn't repay close scrutiny of the situation it depicts. Why exactly is Raggedy Ann cuddling those two dolls (who are unusually small), considering that she's a doll herself? 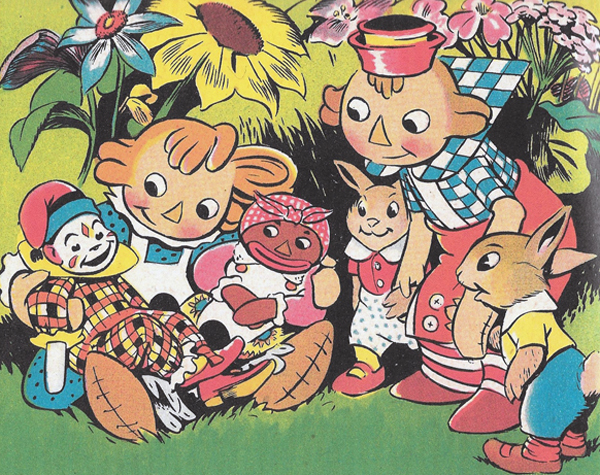 Wouldn't it make more sense if she were cuddling the two bunnies, with Raggedy Andy and the other dolls looking on? And why am I devoting even a moment's thought to such questions? Bob Barrett points out that another Dell subscription premium that I mentioned in that July 23 post, "The Disney Gang at the Circus," a fabulous little poster by Walt Kelly, has been reproduced—not well enough and not large enough, I'm sorry to say—in Walt Kelly: The Life and Art of the Creator of Pogo by Thomas Andrae and Carsten Laqua, page 60. From Bob Barrett: Just caught your posting of the Raggedy Ann Dell pinup. While certainly true that George Kerr drew almost all of the Raggedy Ann stories, Morris Gollub was also closely associated with the comic. He drew many of the covers as well as features in almost all issues. So it wasn't unusual that he was chosen (by Oskar Lebeck?) to draw this pinup. From Don Phelps: Can't wait to see the new book. I used to have a massive Dell pinup collection including all three of the 1951-52 versions of the DELL gang at the ol' corral: with Felix, with Krazy Kat and without either one. Also the Circus Kelly piece, the FIRST Looney Tunes and New Funnies pin-ups, lots of the fold-out pics of five (there were two different sizes each with different pics for all these including Little Lulu, T & J, etc., etc. ), I THINK all of the important Disney stuff including the wall hangers, ten-piece cover set, eight-piece cover set...all the Disney, Looney Tunes and New Funnies sets of stamps, on and on and on.....also, there were FOUR different versions of the DELL membership card including the extremely rare first version which featured Howdy Doody as one of the head shots (I calculated it down to it being made available for three months before Howdy was gone off the card.). The one pin-up that I never came across, however, was the Raggedy Ann, which you pictured. Did Bob Barrett have the actual pinup or was image taken from the back of the comic? Keep up the good fight. MB replies: When Bob Barrett sent me the scan of the Raggedy Ann pinup, he wrote as follows: "I've been looking for a nice one for years and years but have had little luck; I did pick one up on eBay a couple of years ago but it was in such bad condition that I hated to bid on it. I did anyway and won it. It had been subjected to moisture and was stuck to the glass of the frame it was in, so I didn't try to pull it apart—just left it as it was. A friend of mine just sent me this jpg." My theory is that because the Raggedy Ann and Andy comic book appealed to small children, the comics got a lot of rough handling, probably rougher than what older kids gave to comics like the Barks titles. My own Raggedy Ann collection is notably short of copies in particularly nice condition, so I'm not surprised that the pinup too is hard to find in presentable shape. From Peter Hale: Very odd to see Cleety and Beloved Belindy reduced to relative doll size when they are toys of equal size and status to Raggedy Ann and Andy. (Belindy, indeed, has authority over all the toys in the toyroom!) It has a creepiness reminiscent of those old 50/60s comic book covers that show the featured character trapped in some nightmare situation controlled by their nemesis - "Cleety and Belindy reduced to helpless toys in the grasp of an evil Raggedy Ann? - Read Ragdolls of Doom! inside!" ...to the question I raised near the end of the previous item. A friend wrote, in regard to my July 23 post: "As to your latest blog entry about the Dell poster—how fanboy of you to post 'Look at the hot collectible I just bought.'" When I read that, tears of joy filled my eyes. For decades, I've been condemned as a surly misanthrope, quite the opposite of the true fanboy. Another author declares in the preface to his book about animation: "I love cartoons." Not me. I love some cartoons, I like others, and I dislike or loathe a great many more. I would feel silly saying "I love cartoons," and where comics are concerned, my dislikes are even more pronounced. No true fanboy would admit to discriminating in that manner, but like an incorrigible sinner who has been redeemed through one selfless act, I have entered the fanboy paradise by sharing my Dell pinup with all of you. If I may once again quote the immortal words of Albert the Alligator, it makes a man humble, and quietly proud. And now, just to confirm my new status, here are some very fannish artifacts: a few photos from my May 1971 trip to Disneyland, a delayed honeymoon, no less, on which I seem to have made a special effort to seek out attractions that would be scrapped and thus become the objects of fanboy nostalgia. The Skyway to Tomorrowland! The Pack Mules Through Nature's Wonderland! You shoulda been there, kids. 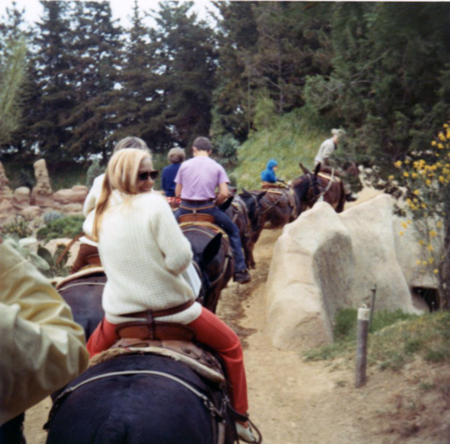 If there are any Disneyland aficionados in the audience, and you see anything noteworthy in these photos (other than my very young bride, who's looking back from one of the mules), please share your knowledge with us. From Robert Forman: Your recent comment and pictures of Disneyland made me feel nostalgic for the Disneyland of my youth. When I was growing up, during the late '50s and early '60s, we went to Disneyland every year (I lived in Los Angeles), usually as a birthday present for me or my sister. I have fond memories of that Pack Mule ride, though no fond memories of the long line you had to wait in to go on them, particularly during the summer. I have a question that perhaps you can answer regarding the Disneyland rides. Although there are many that are themed to Disney movies, there were none themed to Disney’s regular cartoons or cartoon characters such as Mickey, Donald, etc. 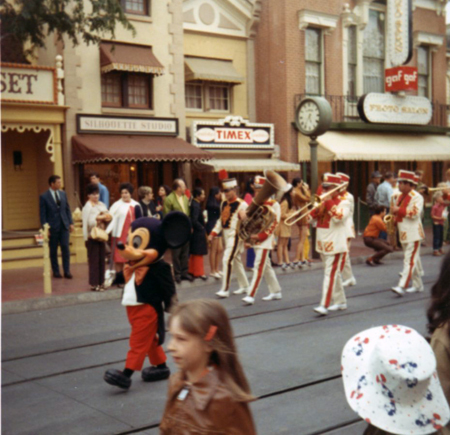 The short subject characters were seen only as actors dressed up, such as the one leading the parade you photographed.Did Disney ever give any reason for that? Cartoons like Lonesome Ghosts or The Three Little Pigs would have seemed to have been naturals for the dark ride treatment. MB replies: An interesting question, and I'm afraid I don't have a definitive answer. But I can point toward page 255 of my book The Animated Man, where I say, in brief, that Disneyland's dark rides were in their fundamentals much like those of older amusement parks, with the difference that they told highly compressed versions of stories familiar from Disney animated features. However familiar the Disney short-subject characters were, individual short cartoons weren't nearly so familiar, and so transforming something like Lonesome Ghosts into a dark ride risked could have risked baffling the audience. Three Little Pigs was one of the rare shorts that wouldn't have posed that problem, but I don't see a lot of dark-ride potential in that story, at least compared with features like Peter Pan and Snow White and the Seven Dwarfs. 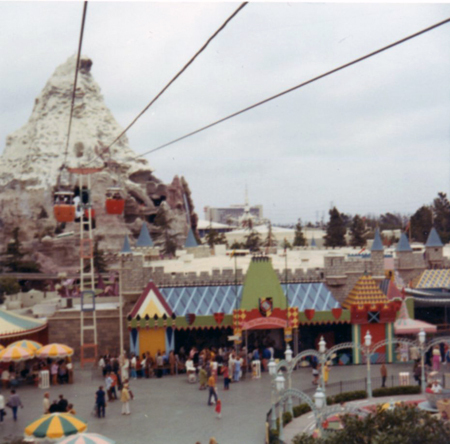 From Paul Penna: Robert Forman asked about Disneyland and the classic short subjects, so I have to mention what was possibly my favorite ride. Not a dark ride, but in fact a bright-sun ride, the Storybook Land canal boats passed by, if not characters, at least references to three: The houses of the Three Little Pigs and the Big Bad Wolf, a patchwork quilt from Lullaby Land, and some windmills from The Old Mill. Models always fascinated me, as they did a high school chum, such that we built Alice in Wonderland- and Sleeping Beauty-themed dioramas out of construction paper, cardboard and old Christmas tree lights in my basement, plus a mini-Storybook Land with sturdier wood models and minature trees in my back yard. 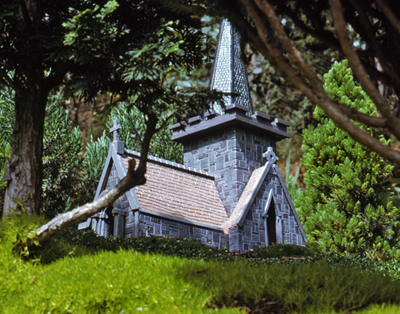 We had the Seven Dwarfs's cottage plus Toad Hall and Mole's house from Wind in the Willows, but our masterpiece of sorts was a church modeled after the one in Alice's village in Disneyland's original, photo attached. Pack mules at Disneyland? I never knew, and I went there around the time of these photos. What a nice, real-world experience to season all the theatrical set pieces.